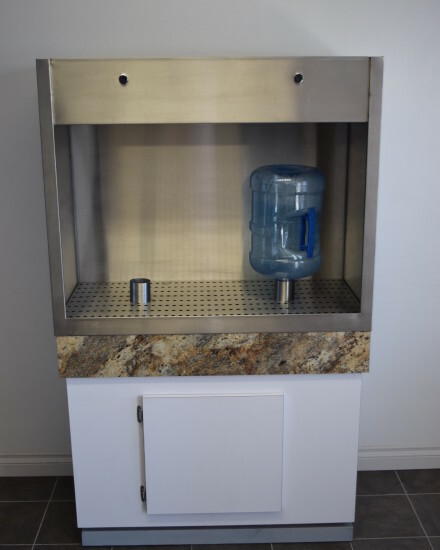 The Bottle Rinse water bottle rinsing station is a high-quality bottle rinsing and sanitizing station that uses ozone injected pure water to rinse and sanitize bottles prior to filling. It offers a very user friendly, hassle free process for sanitizing and rinsing bottles in an efficient and effective method. The Bottle Rinse water bottle sanitizing machine kills all bacteria, viruses, spores, and algae by rinsing with ozone enriched water. Ozone is capable of killing 99% of biological bacteria without any negative side effects or health consequences. Ozone oxidizes the organics in water that cause 99% of undesirable taste and odors found in water bottles. Ozone is the fastest method to sanitize water bottles making the Bottle Rinse essential for water projects where quick sanitization is required. 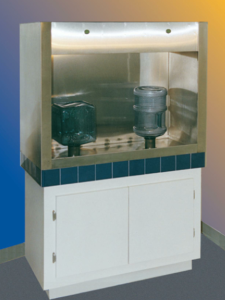 The Bottle Rinse water bottle rinsing station is used in applications such as water stores and bottling operations that use large bottles. This product is currently used worldwide and can be configured to work with almost any electrical system. Water bottles often become extremely contaminated while sitting after use, and the Bottle Rinse sanitizing machine is made to remove this contamination prior to refilling bottles. Contaminated bottles are can be very dangerous to drink from due to the various types of bacteria that can grow in hot, humid conditions such as in water bottles. Putting purified water in a contaminated water bottle defeats the purpose of using purified water, and therefore it is essential to sanitize and rinse bottles for drinking water. 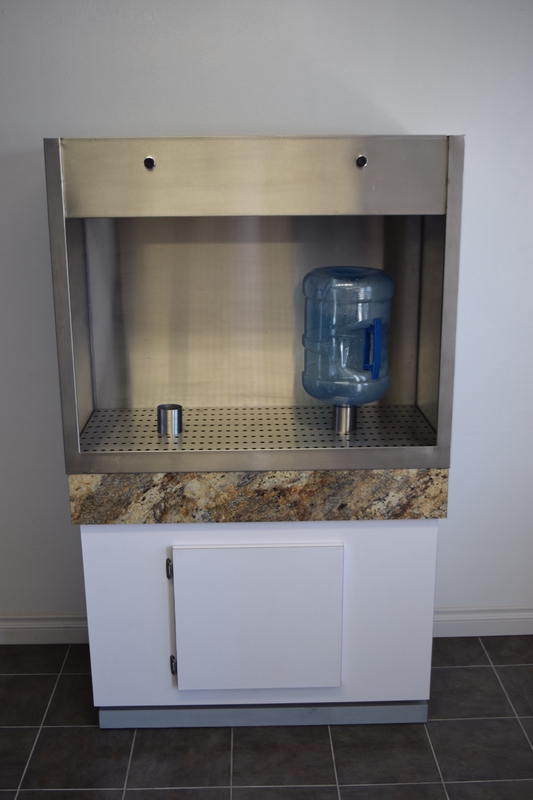 The Bottle Rinse Water bottle rising station has a stainless steel rinsing cabinet with two rinsers, allowing you to rinse two bottles at a time. It is very user friendly; just insert the bottle upside down in the designated collar/guide, hold the bottle, and press & hold the button to rinse for approximately 10-15 seconds. Then let the bottle drain and remove the bottle. At that point the bottle will be sanitized and ready for filling. This process leaves no unwanted soap residues, chemicals, tastes, or odors in the bottle. This ensures that the water filled into the bottle is not only contaminant free but tastes and smells clean as well. The Bottle Rinse water bottle sanitizing station uses four times the amount of ozone needed to kill bacteria, viruses, spores, and algae. The ozone molecules break down very quickly so that there are no negative health consequences or effects. Ozone is a very safe and effective method to sanitize contaminated bottles. 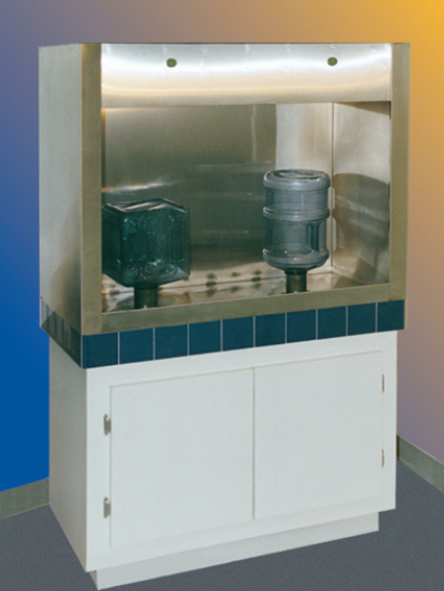 The Bottle Rinse water bottle rinsing station features a stainless steel top cabinet and Formica bottom cabinet. The bottom cabinet can also be made with a Corian build up to match the Corian FillStation. The color and finish options are always customized to ensure that the Bottle Rinse will match your color scheme and other water store accessories, such as the FillStation. The Bottle Rinse water bottle sanitizing station uses a standard 110/120V power supply allowing it to be used anywhere worldwide. It can be made to run off of 50 or 60HZ electrical, and converts the power to 24V to run the components to be energy efficient. The rinsing nozzles are designed to restrict flow to 2.4GPM allowing it to rinse bottles without using much water. Ozone kills bacteria, viruses, spores, and algae 3000 times faster than chlorine or other sanitizing methods. Ozone oxidizes the organics that cause 99% of taste and odor problems. Ozone is faster than all other purification methods. Ozone has a half-life of 20 minutes making it very safe with no adverse effects. Ozone increases the shelf life of water. Ozone Concentration: 1.1ppm into bottle with both sides in use. Plumbing: 1” Water Inlet & 1” Drain. All Components are either NSF/FDA/UL/ETL approved. *Note: Corian finish available at an additional Cost.